The 2017 Chevrolet Bolt was supposed to be the electric car of the people—around $30,000, about 240 miles of range per charge and decent space in a little package. But nobody’s really feeling that, and the company has such a backlog of Bolts that it had to extend the summer shutdown of the car’s manufacturing plant. Reuters reports that GM’s U.S. inventory hit a 10-year high in June, meaning the manufacturer has a whole lot of unsold cars hanging around. Reuters reports that Bolt sales are under 8,000 so far this year, which isn’t great. After all, the Nissan Leaf was even beating Bolt sales in April. To show just how dramatic this sales slump is, Reuters reported that Paul Masse Chevrolet in Rhode Island advertised having more than 200 Bolts in inventory on Monday with prices from $35,688 to $41,488. Jalopnik could only find 83 in its inventory, all new, which is still a lot. The dealership’s advertised inventory as of Tuesday was 688 cars, new and used from seven different manufacturers, and 83 of them were Bolts. That’s over 12 percent. A spokesman for the company said the shutdown at Orion was “due solely to softening sales of the Sonic” model, adding that its production plan for the Bolt for this year was unchanged. GM has sold 7,592 Bolts through the first six months of this year, after rolling out the car at the end of 2016. From June 1 to July 1, supplies of the Bolt rose to 111 days from 104 days. 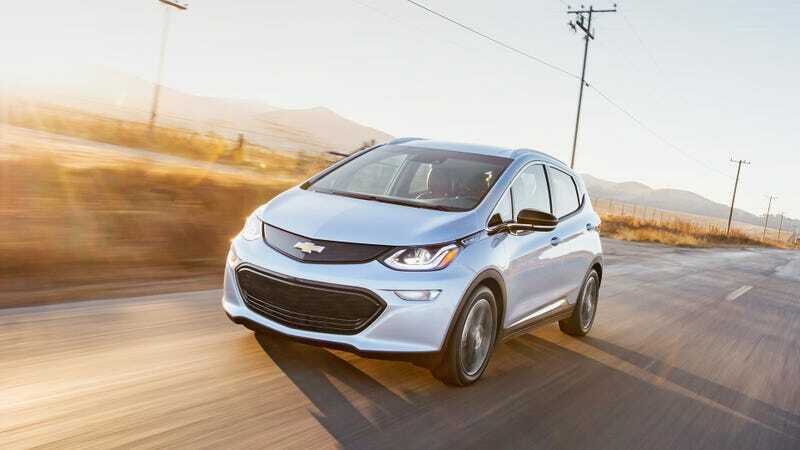 GM launched the Bolt in California, but has said the car will be available in all 50 states by August. On Monday, Paul Masse Chevrolet in East Providence, Rhode Island, advertised on its website that it had more than 200 Bolts in inventory at prices ranging from $35,688 to $41,488. The Bolt plant isn’t the GM one to extend the shutdown period, with Reuters reporting that the Ohio plant that makes the Cruze and the Missouri plant responsible for the Malibu are both shutting down for an extra three weeks as well. An Ontario plant that manufactures the Impala will shut down for an extra two weeks to reduce inventory, according to Reuters. It’s also a hard lesson in #brands to look at the Bolts sales versus the pre-orders of the Tesla Model 3, which is Tesla’s more pocket-friendly EV. The Model 3’s base price is $35,000 compared to the Bolt’s $37,000, and early estimates of its range were at least 215 miles compared to the Bolt’s 238. Chevy says the 0 to 60 mph in the Bolt is under 6.5 seconds, whereas Tesla claims the Model 3’s to be 5.6 seconds. But here we are, with the Model 3 having nearly 400,000 preorders still hanging around waiting for a delivery and less than 8,000 already-available Bolts being bought in seven months. Thus, the storyline continues: Tesla can’t make enough cars, whereas everybody else is just making too dang many—no matter how hard everybody else tries to compete.